At least two people were killed and dozens injured on Tuesday when two trains collided in the South African capital Pretoria, an emergency services official said. “We have got two confirmed fatalities, and we have got different emergency services on site,” Charles Mabaso told Reuters. 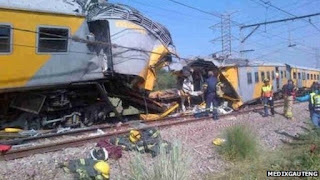 South Africa is one of few African countries that has a very functional rail system. The incidence of train accidents have been recorded once a while over the years.